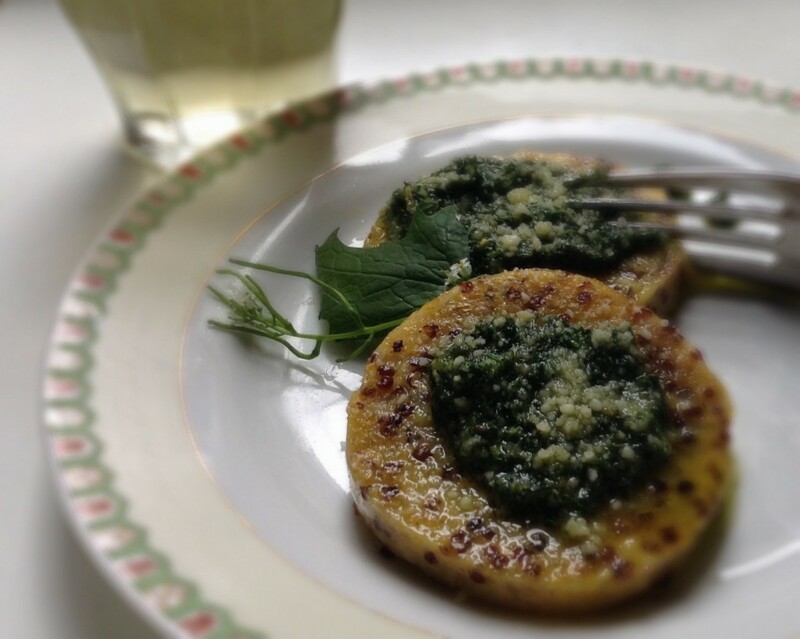 Foraged Garlic Mustard Pesto Recipe – Eat the Invasives! 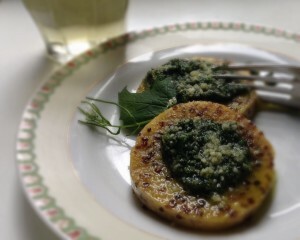 I know, I know: it’s a forager’s cliche to use garlic mustard (Alliaria petiolata) in a pesto recipe. You know why that is? Because gosh darn it, it’s good. So here’s how to identify garlic mustard and, yes, how to turn it into pesto. This is a recipe from The Forager’s Feast: How to Identify, Gather, and Prepare Wild Edibles, my new book that is shipping to a bookstore near you this week. Yay, new foraging book! Garlic mustard is a biennial that has been hanging out all winter, even when its leaves were buried under snow in cold winter areas. The plants will start putting out lush and perky new growth now that the days are noticeably longer and temperatures at least slightly milder. It tastes like a lightly bitter leafy green with flavors of — you guessed it — garlic and mustard. This plant offers several different ways to spice up your cooking. It is a biennial, which means that it starts growing in the late summer and fall of one year, overwinters, and then goes to seed and completes its life cycle the following year. During its first year, it hangs out as a rosette of heart-shaped leaves with scalloped margins and a net-like pattern of veins. In late winter and early spring, I like to use foraged garlic mustard combined with milder greens and field garlic in pestos and braised greens. That is also a good time to dig up some of the roots. These can be used just like horseradish. They’re stringier though, so best minced very finely. Further into spring, Alliaria shoots up flower stalks that can get to be 2 1/2 feet tall. The flowers start out looking like miniature broccoli heads, then open into small, 4-petaled white flowers. The leaves on the flower stalks have a more pointed, triangular shape than the rosette leaves. When the new flower stalks are still tender (around 8 inches tall), and bearing the green, unopened (or just starting to open) flower heads, treat them like broccoli rabe. At this stage they are one of my absolute favorite wild vegetables. Stir-fry the greens in a little extra-virgin olive oil, a few red pepper flakes, and a pinch of salt – delicious as is or added to pasta and served with grated cheese. In summer, the flowers turn into slender, dry capsules 1 to 2 1/2 inches long. Before the seed capsules are fully dry, when they are still green and easy to pinch in half, they are a good, mildly-spicy raw snack. Once ripe, each capsule contains a row of black seeds. Here’s a quick video on how I gather and winnow wild mustard seeds (works with garlic mustard, too). You can grind these and add water, vinegar, beer, or wine to make “prepared mustard” (the stuff you’re used to buying from the store, only better). 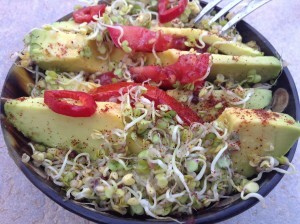 You can also sprout them (instructions for that in The Forager’s Feast. Did I mention that I have a new book coming out?). 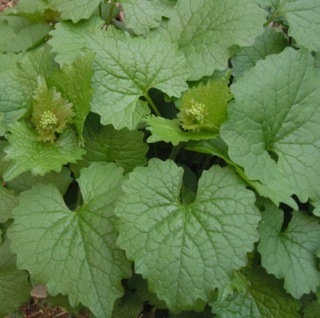 Garlic mustard is an invasive european species that has naturalized on four continents. You can harvest it freely without worrying about sustainability issues. You won’t make a dent in this plant’s population by eating it all year. Look for garlic mustard in places that will be only partially sunny or in light shade once nearby deciduous trees have leafed out in the spring. Put the nuts and garlic into a food processor or blender. Blend until the garlic is minced and the nuts are finely chopped. Add the garlic mustard leaves and the chickweed or parsley. Pulse a few times to coarsely chop the leaves. With the processor or blender running, add the olive oil in a steady pour, stopping 2 or 3 times to scrape down any leaves that are clinging to the sides of your machine. Add the cheese, if using, and blend for a few seconds longer. Add a little more oil if it seems too thick, more nuts or cheese if it’s more liquid than you’d like. Add salt to taste. Toss with pasta, add a spoonful to top a soup or stew, serve on top of polenta, or use as a dipping sauce for a good, crusty bread. Always be 100% certain of your plant identification before eating any wild plant.